Halberd tomahawks are a design offshoot from medieval pole arms called Halberds which became smaller with shorter handles. Halberd tomahawks were often but not always smaller in size than their polearm halberd counterparts, & always with much shorter handles naturally ~2 foot or less versus 5 or 6 feet long for a regular halberd. With many halberd heads missing their shafts it can be nearly impossible to determine with absolute certainty whether it was used as a halberd tomahawk or simply a halberd polearm. Unbalanced and unwieldy, they were used during the 1700's and seem to have run out of favor completely by the end of the Revolutionary War. It has been reported, and probably correctly so, that Chief's carried them more as symbolic status symbols than for actual use. They varied by their connection to the handle-- socket form, elongated tang form and this blind mortise form shown below. Some had pipe bowls or spikes or hammer poles. there were many varied styles & no doubt many were made locally. 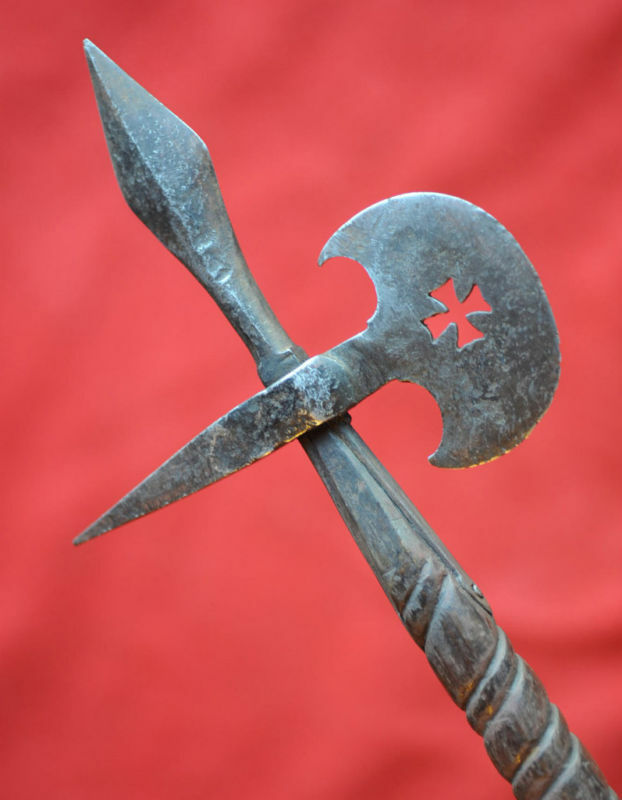 This halberd tomahawk with obverse and reverse views, has a 10.25" spear, 5" beak, crescent shaped blade measuring 6.25", & a 3.5" conical base secured by two rivets and welded to the other metal regions. 21" overall. This particular one is a mere 10.2 ounces and measures 7" tall x 5.5" wide. The blade on top is sharpened on both sides & has been dented on top. This one is unusual in that unlike most halberd tomahawks it does not have the elongated iron tang on the bottom for attachment to the handle. Rather it has an eye hole 1" in depth by 1.25" wide which accepts the handle and a hole to rivet it to the head. 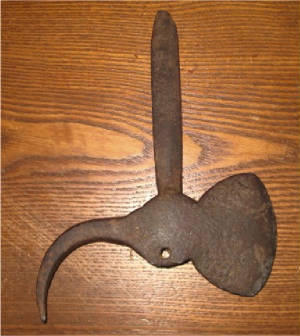 It would have had a handle 13"-20" long made of wood-- or in this case probably iron or brass. 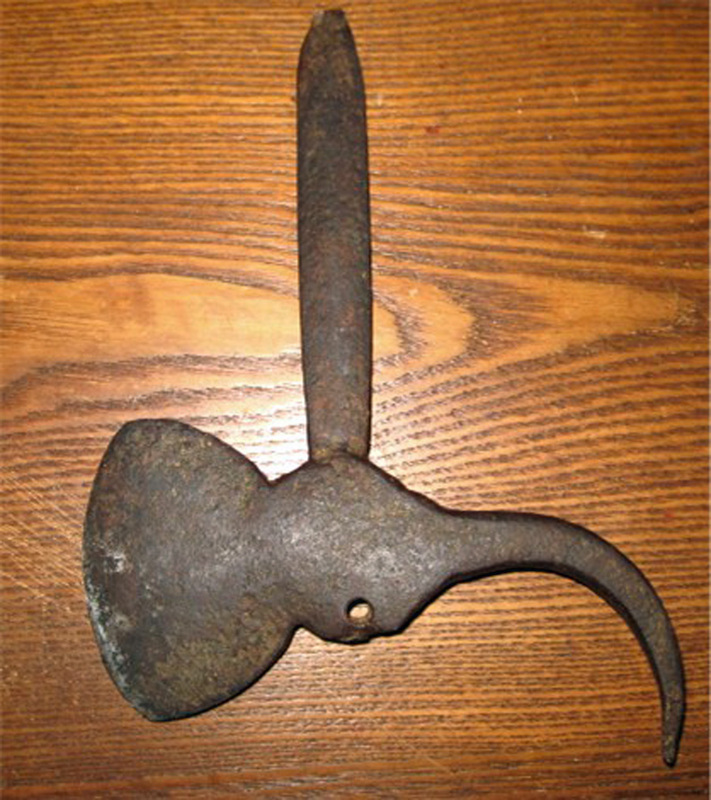 Several documented examples of this type without the elongated iron tang do exist. 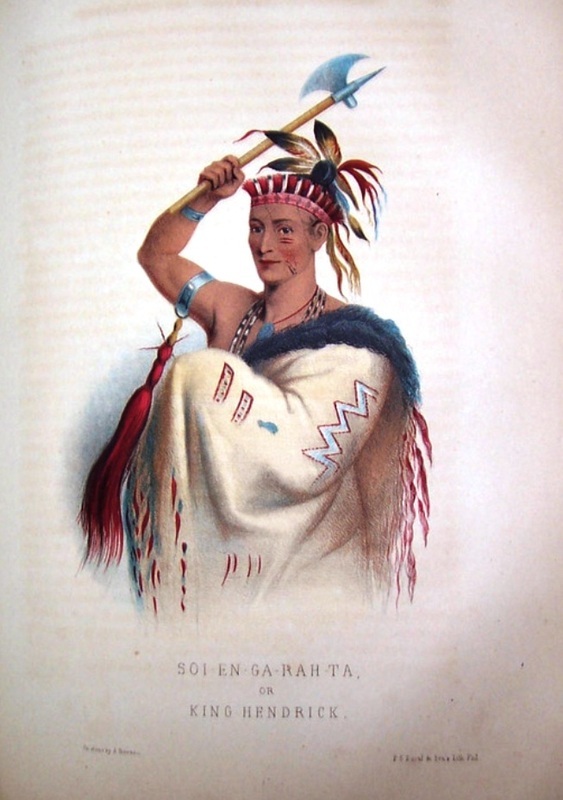 This particular example came from an estate near the Akwesasne Mohawk Reservation near Massena, in upstate NY. 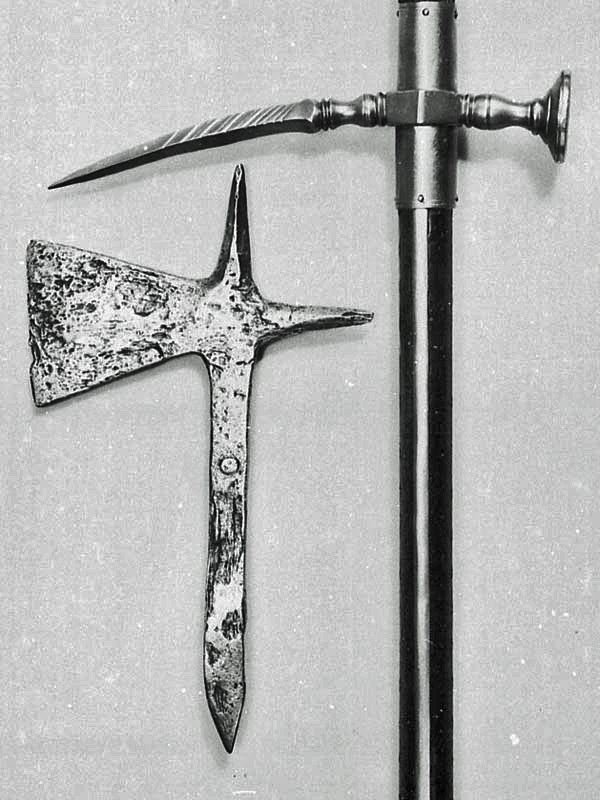 There is an interesting story of a halberd tomahawk allegedly belonging to Daniel Boone described in detail in the book Indian War Clubs of The American Frontier by John Baldwin. It seemed strange that such a famous and valuable artifact would be difficult to locate or find out more about, but it was. I did some extensive research trying to find the blacksmith who supposedly marked it called Robert Beatty from Crum Creek, PA in 1770. There was a Beatty Axe Company there but William Beatty didn't begin making axes until 1806 and they were never known to have made weapons in the records. William Beatty did have a brother named Robert C. Beatty who also made cutlery/edged tools but he would not have been born by the 1770s. So I checked with the Tennessee Historical Society where Baldwin claimed it was stored and asked about the tomahawk. They sent me to the Tennessee State Museum which housed their collection and the curator came back saying they never owned any Daniel Boone tomahawk or knew anything of it. So with more research I found a 1988 article called "Daniel Boone Fakelore" referring to this same Daniel Boone tomahawk that was supposedly lost and then plowed up being located at the Kentucky History and Science Museum in Louisville. I have not heard back from that museum yet but currently I believe the provenance for this story was completely invented. (Update: they have no knowlege of it). No further reference to this story of the lost and found Daniel Boone tomahawk or even owning a halberd tomahawk can be found in ANY publication about his life. The reference to blacksmith Robert Beatty whose "weapons were famous on the frontier for over a century" appears only found in Baldwin's book. Strangely none of the many books & articles dealings with frontier weapons makers mentions the blacksmith Robert Beatty among them. Where Baldwin got the story I do not know but it probably originated from this 1955 article: Harry Wandrus, "Daniel Boone's Tomahawk," Hobbies-the Magazine for Collectors, April 1955, pp. 114-15. No one is able to verify the whereabouts of the tomahawk --or at least they're not willing to admit it. The story related in the 1955 article had originated in 1898 from a collector named William E. Connelley of Beatrice, NB. who reportedly got the story from the previous owner who got the story from that previous owner with no documentation to verify any of it. Or at least that is what Connelley relates. The details of Robert Beatty are mixed up with his brother William Beatty (two different axe makers in different locations) and filled with inaccuracies in the 1898 letters. 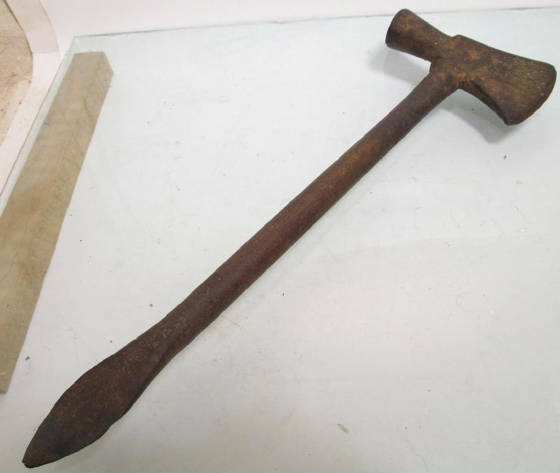 I verified the facts of the Beatty Edged Tool Company and Robert Beatty with a direct descendant who has done extensive research on them and published in the Early American Industries Assoc. 2007 June. He said the details were "playing fast and loose with the facts". I.E. The statement that Robert Beatty made weapons during the Revolutionary War and Civil War was not possible since he was born 1770 and died 1856 five years before the Civil War started. 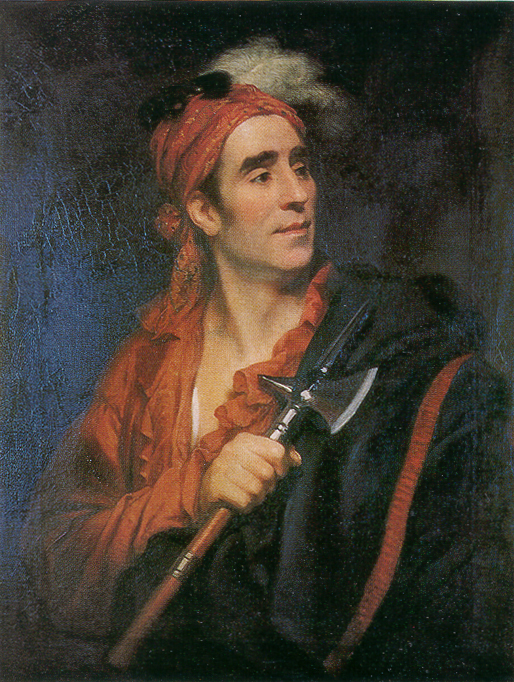 Also Robert Beatty could not have made this particular tomahawk in 1770 --the year of his birth! One of the 1898 letters was related from a story his 80 year old father told him. 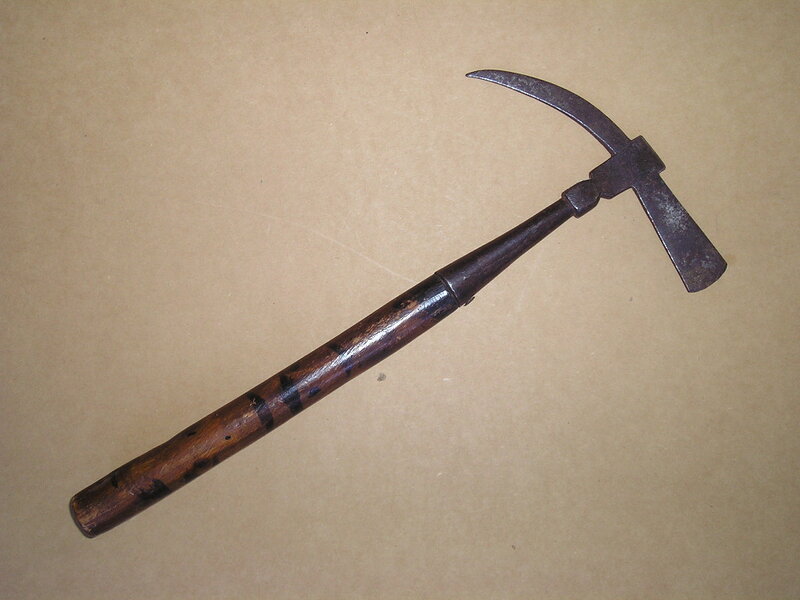 Again, no source other than handed down hearsay directly links this tomahawk with Daniel Boone and no museum claims to have ever owned it or heard of it. Faker's sometimes invent elaborate stories too as most likely happened here somewhere along the way. Many small museums, historical societies and libraries display donated or purchased artifacts that with expert scrutiny are revealed to be fakes. This is especially true with items purported to be owned by famous people. Documentation needs to be backed up with verifiable evidence. Otherwise its just basically gossip. Unfortunately that is how many of the few Tomahawk reference books are written. The inevitable question posed to all these reference books should be "how do you know that is true?" If the answer is "I heard it"...or "the owner told me", then what true value does it have? If you would like to read further on the many Daniel Boone attributed fakes this is a great article. Remember that tree where Daniel carved he killd a bar with the date? It probably wasn't true either. In fact trees with similar fake carvings were & are found all over Tennessee, North Carolina, Kentucky, etc. Halberd pole arms and halberd tomahawks are often identical in size and shape concerning the ironwork. Usually the only difference is in their wooden handle length. When the handle is not present we have to wonder was the handle (if it had one) 6 feet long or 2 feet-- or both since many long halberd pole arms were converted to shortened halberd tomahawks. Tomahawk collectors are tempted to identify more as halberd tomahawks, whether they are or not. Some, such as with these spear pointed iron handled ones below & above this text, were not on any wooden haft but used as is. 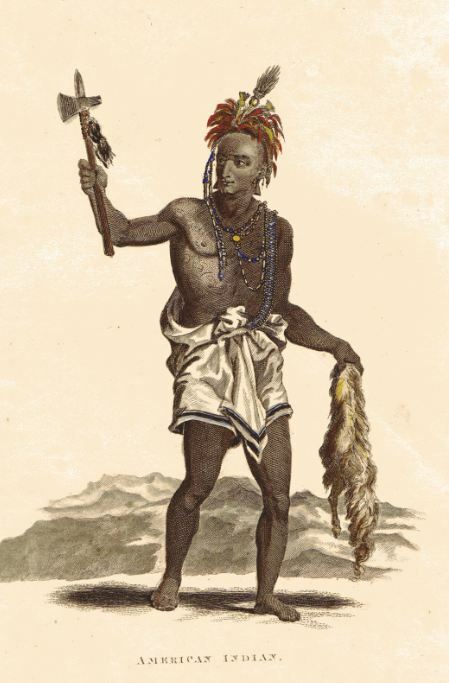 This sketch is from the book "Travels through North and South Carolina, Georgia, East and West Florda..." by William Bartram, Paris 1792. 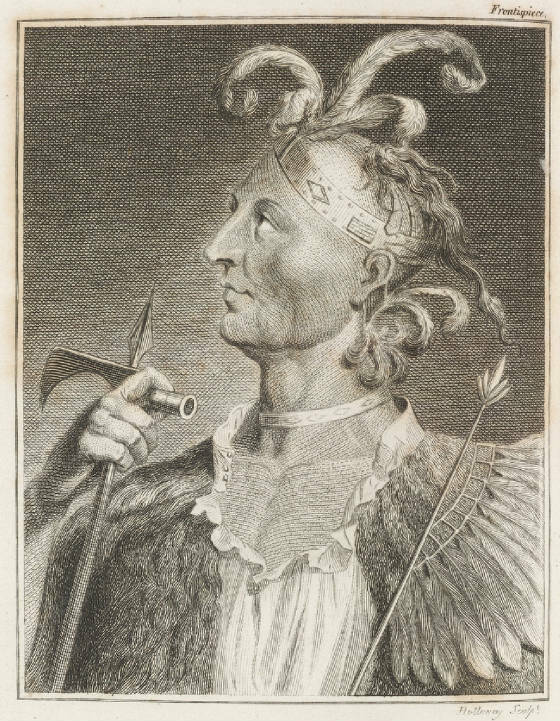 It shows a Seminole Chief with a halberd pipe tomahawk. "Mico Chlucco the Long Warrior, or King of the Siminoles"
This 13" long halberd tomahawk is rather unusual in that it has 2 splayed out flat chisel-like projections instead of spikes. I have only seen one other halberd head of any type with this kind of projection. 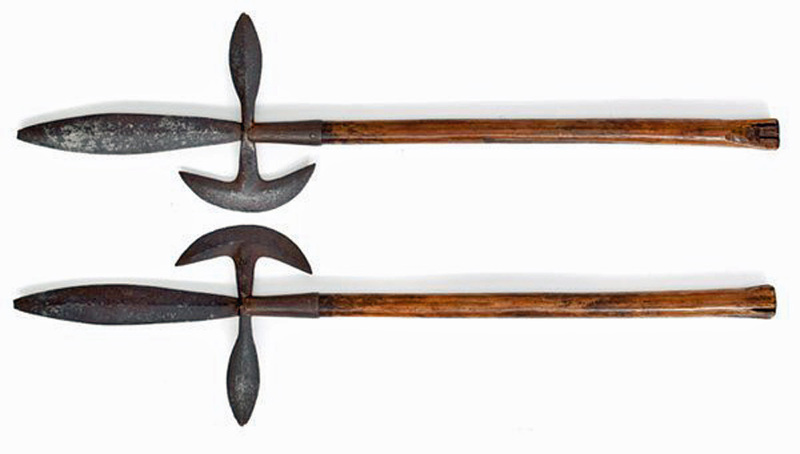 There are other types of battle axes that can be confused with these Native American used halberd tomahawks. 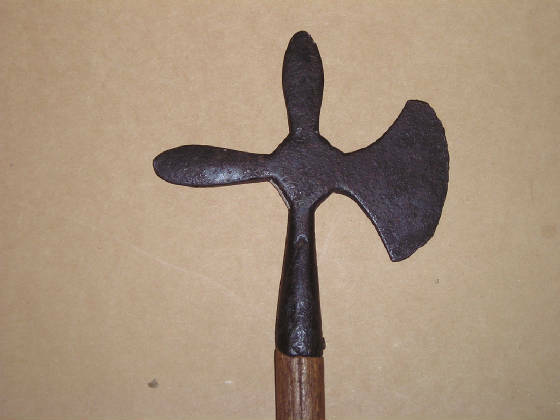 It is difficult to attribute them to Native American usage when similar examples exist as battle axes from other countries that were never brought here. With so many of these varieties unknown to us there is a great danger in over extending our definitions of halberd tomahawks. 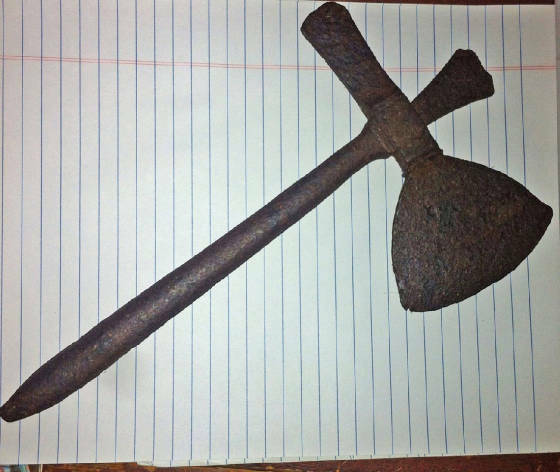 The item on the left below is from Germany and called a HURLBAT that was thrown at the enemy in the middle ages. 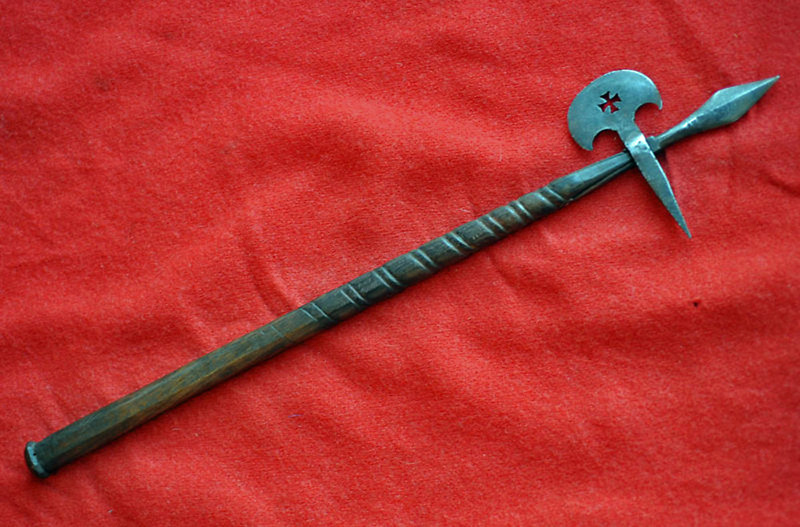 This 26" long battle axe/halberd from Lithuania was obviously not used by Native Americans yet looks remarkably like what we assume is a halberd tomahawk. Not all polearms apparently had long handles. We are not done learning about these ancient weapons. 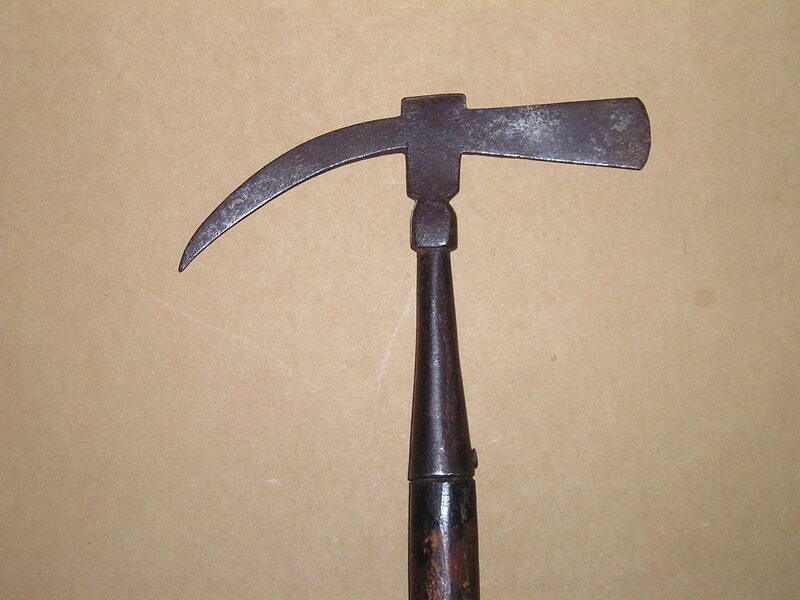 Halberds can easily be confused with other odd tools such as this 15" crate hatchet. Crate hatchets were used to open and re-nail wooden crates (before the cardboard box era). There are many variations of them. Some were even marketed with the name tomahawk. Halberds and battle axes have been reproduced & still are --some faked with artificial aging. In the Victorian era there began an upsurge in reproductions of antiquities from Rev. War 'penny' knives to pole arms from the middle ages. Many of them were forged & some cast from originals. After more than a 100 years of age on those they can look very authentic. 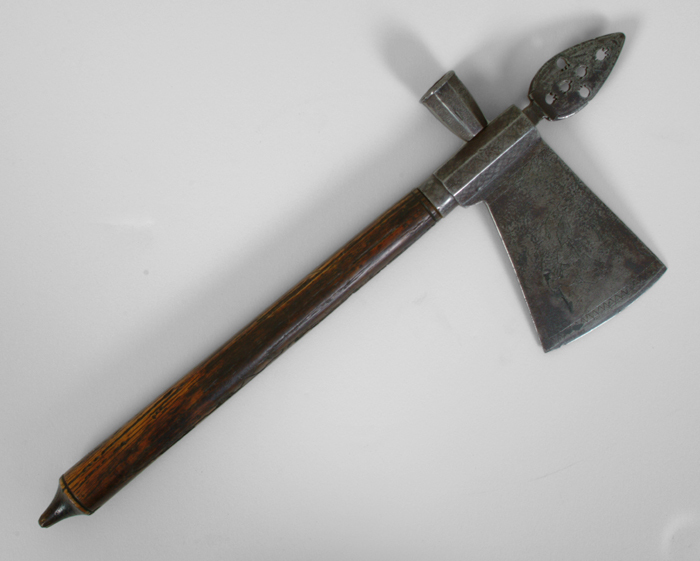 I see one halberd tomahawk for sale now on ebay today that fits that category. Please keep in mind they never stopped making these. They are still being hand forged today! "American Indian Tomahawks" by Harold Peterson. "Daniel Boone's Tomahawk," by Harry Wandrus, Hobbies-the Magazine for Collectors, April 1955, pp. 114-15. 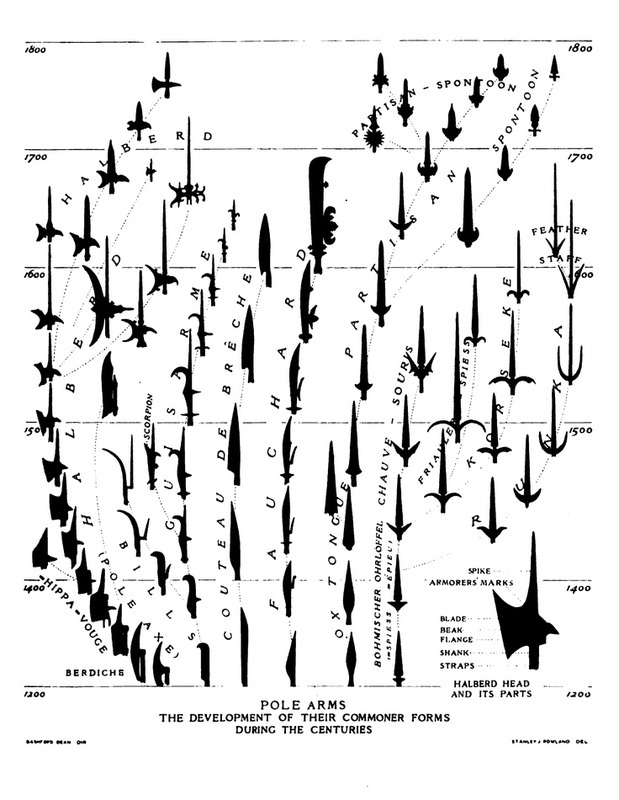 The Halberd & Other European Polearms 1300-1650. ﻿"Br﻿other, you say there is but one way to worship and serve the Great Spirit. If there is but one religion, why do you white people differ so much about it? Why not all agreed, as you can all read the Book?"